[By Shari Blaukopf in Savannah, Georgia] I spent my spring break sketching in beautiful Savannah and Palmetto Bluff. On the way home the airline lost my bag with all my sketches and supplies. I knew it was bad news when the ticketing agent had a confused look on her face just as my suitcase disappeared on the conveyor belt. At first she thought she had put the wrong tag on my bag, but then she looked at the receipt in her hand and reassured me that all would be fine. It wasn't. While I was on my way home to Montreal, my bag made the journey to Denver. And there it sat, and sat and sat... for ten days, until it was discovered, retagged and sent back to me. I have never been so happy to unpack a bag. Here are a few of the sketches I rediscovered as I unpacked. Savannah, Georgia is a sketcher’s paradise. 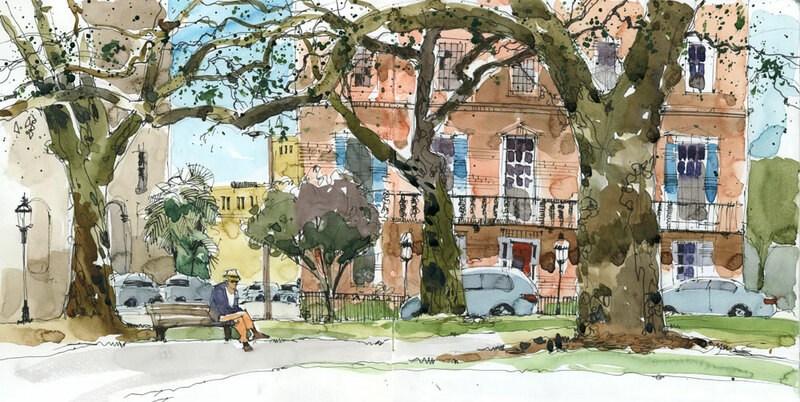 21 historic squares, each one surrounded by restored town houses, shaded with Spanish moss and flanked by wooden benches. I couldn’t decide which one to sketch, but with some rain clouds threatening, I chose Oglethorpe Square. It seemed fitting since General James Oglethorpe was the founder of the colony of Georgia and one of the original planners for the settlement of Savannah. In true Southern style there was a dapper gentleman in a straw fedora and peach-coloured pants spending his Sunday afternoon reading a book. Some Flannery O’Connor stories, no doubt. Factor’s Walk is a little bit of Savannah history. All along the riverfront you’ll find a row of tall brick buildings that formerly housed the Cotton Exchange, which included warehouses for the cotton and offices for the brokers (factors). These structures, sometimes as high as six stories, are built on a bluff and descend to the riverfront. Steel walkways connect the buildings to the bluff and the rest of the city. My favourite part of the journey down to the river and the Factor’s Walk is by any one of a number of steep staircases that each come with a warning sign: Historic Steps – descend at your own risk. 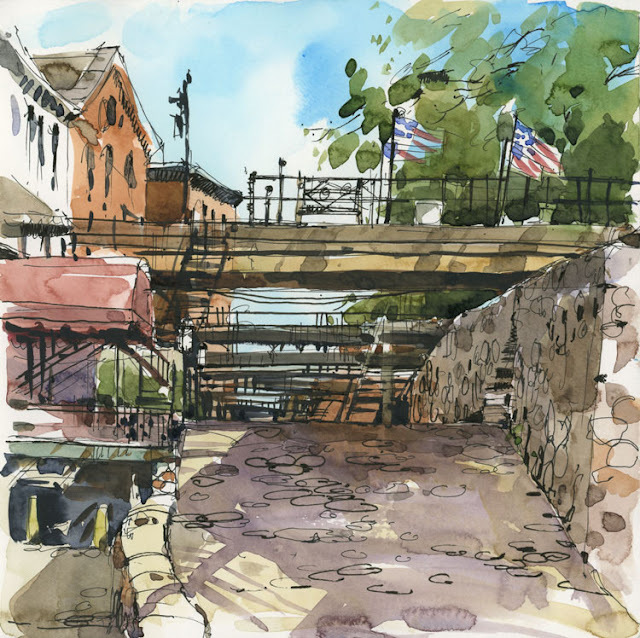 There’s an elevator that you can take – no doubt a recent addition – but then you would miss the view under the walkways and the cobblestones that were brought to Savannah as ballast and left on the shore by departing ships. I would bet that most visitors to Savannah get to see the famous fountain in Forsyth Park, whether on foot or seated in one of the famous touring trolleys, but only the very lucky get to see it around St. Patrick’s Day when the water has been turned green. 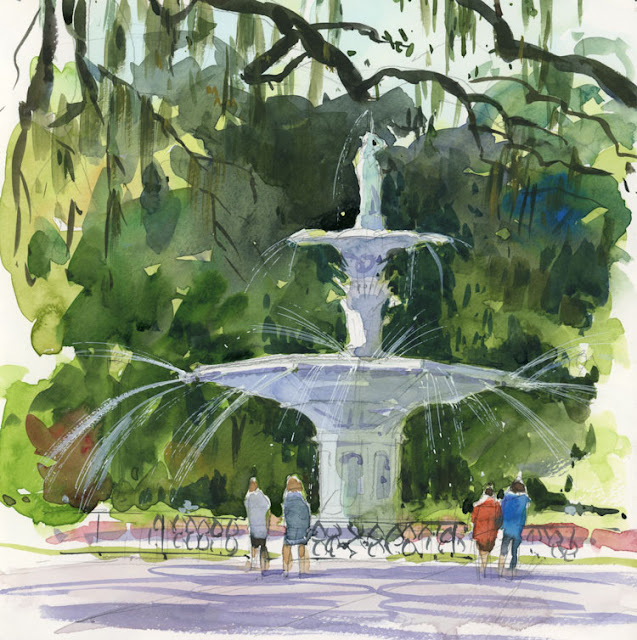 The approach to the iconic fountain is unforgettable — you walk up a wide path lined with azaleas (flowering at this time of year), under a canopy of Live Oaks dripping with moss — and the white fountain is set against a backdrop of deep green. Everyone stops to gaze up at it and many take a seat on a bench nearby to admire it for a longer time. No doubt one of the most magnificent spots to spend an hour or so in the city.